A misconception woven upon humanity … that a veil has fallen. 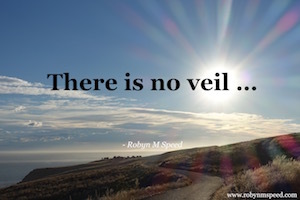 In truth … there is no veil. There is only belief of a veil. In truth … you ‘are’. Here, in this moment, all that separates you from your Infinite Self is an illusion of the veil … a lie of the veil. Lies told over and over … of an illusory veil. And in belief, so was creation made. And in belief of a veil, so did we create our own veil, to obscure us from ourself, to hide who we are, to separate ourself from ourself. And with the making of the veil, so did arise the many excuses for behaviour unbecoming of divinity. In forgetting, we gave gift to the ego to rise and be the driving force, we gave gift to the mind to rule from ignorance and without reason. We gave gift of who we are, into the hands of illusion. And yet … in truth, there is no veil, and there never was. There is no one you need to remove a veil. There is no path you need to journey to find your way to thin the veil. There is no fine vision you need to see through the veil. There is no vibration you need reach to step through the veil. The veil is not there. Time, deceit, and fear saw it woven. It does not need to be unwoven or uncreated. In human form we are not different to that which we truly are. The body is made of the same cosmic stuff as the soul. It is not an animal we occupy. That too was illusion made manifest into solid belief. The body is made of divinity. That dog is made of divinity. The bird is made of divinity. The dirt is made of divinity. The bones of a chicken are made of divinity. There is no thing which is not made of divinity. There is only the forgetting of that divinity, and the confusion of ‘what is this body?’, ‘what is this dog?’, ‘what is this bone?’ Mind and ego tell us what it has been trained to believe it all to be. What does this mean? That there is no veil? It means that there is no magical journey to follow … no holy cup to find … no awakening to happen … There is only to know that there is no veil. You already are that which you are. There is no veil, and there is no difference between you and I, save for our ‘beliefs’ and our ‘illusions’. We are the same cosmic divinity. We are the same cosmic love frequency. There is no striving to get to where we have always been. There is simply the letting for of the illusion of the veil. There is no veil. It did not fall at birth … it never existed. This entry was posted in Life Guidance. Bookmark the permalink. What does it matter where I am from?